I worked for Samsung in South Korea from 2005 to 2010. Quite naturally, I have endorsed Samsung's products for years and have been using them myself. While the company offers a vast variety of high quality products from time to time, my personal favorite has been the Samsung laptops, particularly the new ATIV Book. From past few years, Samsung has only been focusing on premium laptops like the ATIV Book or the affordable Chromebook. The ATIV Book, in particular, is hailed as an ultra-slim device - a perfect blend of power and style. With this, Samsung has up the ante both in terms of performance and design. Besides the visual appeal and eye-catching style, the thing I like the most about Samsung laptops is that they continue to be thin and light and the battery doesn't conk out easily. 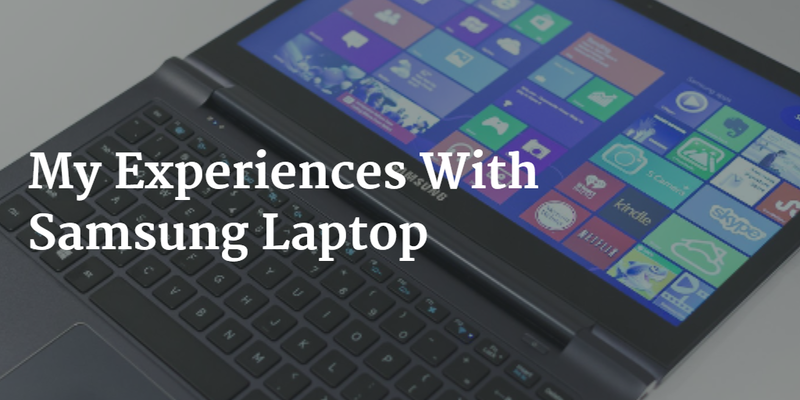 There are other reasons why I like these laptops and am listing them down in this blog post. Samsung fares pretty well on the tech support. The company introduced a new, unique online feature called Smart Personal Online Training (SPOT), which acts like a conduit between laptop owners and tech support reps. Even while dialing their tech support numbers, most reps I spoke with were helpful and did a wonderful job at providing quick resolution. If you look at some of the new laptops from Samsung such as the ATIV Book 9 Ultrabook, you will be able to observe the level of detail put into the design. Right from the Ash Black aluminum chassis to the stunning curves at all the right places, Samsung also succeeds in keeping the weight down to mere 2 pounds. Even the Chromebook is styled with faux-leather that you can't help praising. Samsung is known to be at the helm of innovation. With laptops also, Samsung is maintaining its reputation of an industry leader. For instance, the new Chromebook is fueled with Intel's Celeron processor. The ATIV Book series is packed with features like bright display, sleek frame, quad HD display, and audio with Dolby Digital technology. Samsung laptops come with the updated SideSync software that allows you to receive phone calls and text messages on your computer. That's not all. You can even share your phone's screen on these laptops, and drag and drop files between your phone and laptop. Then there is Samsung Link, which enables you to access important content through multiple devices. Samsung also offers the S Player+ media player along with the S PhotoStudio image viewer and editor. Samsung offers laptops in the price range of USD 250 to USD 400. Finally, Samsung is the brand to go for if you’re considering buying a premium Ultrabook or a low-cost Chromebook. Whatever you decide in the end, one thing is for sure: you would not be disappointed!